Winter 2019 Is Coming; and It’s Going to Be Warm? So what does winter 2019 have in store for the U.S.? Publishers of “The Old Farmer’s Almanac” say it’s going to be warmer than usual. 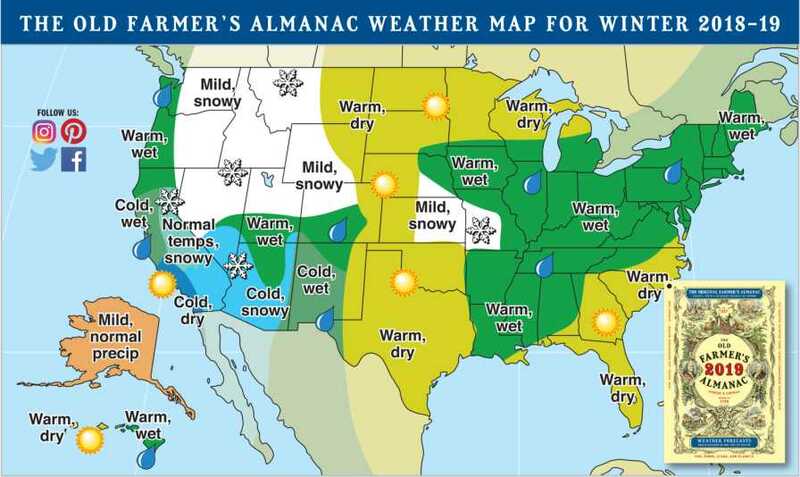 Even though we might still be enduring the “dog days of summer,” thoughts of winter often start to crop up this time of year thanks to publishers of “The Old Farmer’s Almanac,” which has just released the 2019 version of the perennial periodical — its 227th edition. Within the pages are long-range seasonal weather outlooks. And according to authors revealing a sneak peek, above-normal temperatures almost everywhere in the U.S. will be the theme for winter 2019. So, what’s accounting for the warmer-than-normal prognostication? Authors note that it’s due to a decrease in solar activity and the expected arrival of a weak El Niño, which will prevent cold air masses from hampering the northern tier of the country. The only exception is in the Southwest, where a colder-than-normal season is being forecast. Above-normal levels of precipitation are being predicted for most of the country, except in the Southeast, southern California, some of the nation’s midsection, as well as parts of Alaska and Hawaii, where normal or below-normal precipitation amounts are expected instead. The book foresees below-normal levels of snowfall in areas that normally get buried, with the interior West and a small part of the nation’s midsection being the snowier-than-normal exceptions. Authors of “The Old Farmer’s Almanac” report that predictions about weather trends and events are ultimately made by comparing solar patterns and historical weather conditions with current solar activity. Since 1792, “The Old Farmer’s Almanac” has had an impressive accuracy rate, batting 80%. 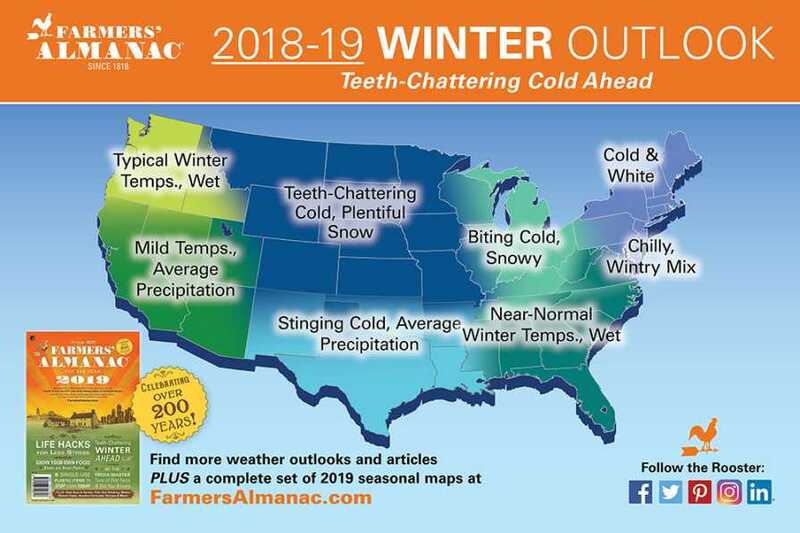 The non-related but similar publication “Farmers’ Almanac,” which celebrated its 200th year in 2018, released its official winter 2019 outlook a few days after “The Old Farmer’s Almanac.” In stark contrast, the “Farmers’ Almanac”is predicting a colder-than-normal winter from the Continental Divide east through the Appalachians. 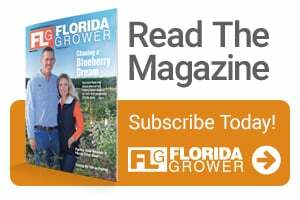 Authors of the Farmers’ Almanac tell a different story for winter 2019. NOAA will follow suit with its own winter forecast sometime in early fall.